I’m done with pumpkin, I’m pumpkined out (note: it only took 3 recipes to do that!!) I got on the bandwagon, I drove it for a while and now, I’m done. Did I change my opinion and become a pumpkin loving convert? Um…no. I don’t dislike it, but I just don’t love it like some people do. Now, once again, this is only the Jack O’Lantern/sugar pie pumpkins, I still enjoy butternut, acorn and other winter squash. But, I’m done with pumpkin; until next fall when I will give it another go. So, onto other delicious things that are available now; chocolate, for example. I find that I make very few chocolate desserts during summer. I think the delight of seeing so many fresh, summer berries and fruit just draws me to them and imagination runs wild. Come winter though, I really begin to crave chocolate. I’ve already made chocolate cake, brownies and cookies for us over the past few weeks, basically as soon as the weather turned cold and has remained cold, I’ve been cranking out chocolate confections. There is something instantly warming and comforting about gooey chocolate desserts whether they are served with ice cream or warm custard. This isn’t a warm chocolate dessert though but its incredibly good. Once again, it came about because I needed to use up egg whites that were left over from my pecan tart. I originally wanted to make macarons but was plain out of nut flour of any kind and making my own just seems too much work for that day! Taking the easy way out and working with what was in my fridge that day, I decided to make these White Chocolate Mousse Meringues. Ok, so it’s not a true mousse but it sounded better than white chocolate cream, and as food bloggers we know that coming up with fancy names makes the dish even more delicious ;). These can be considered mini pavlovas, I suppose, since I did use a pavlova base. But, whatever you want to call them, all I know is that they are pretty darned good. They are also way easy to make and pretty stunning on a plate for a fancy dinner or even a buffet. They hold up remarkably well in the fridge for a few hours and so, can be made ahead. The topping I used is some very good quality French preserves. My thinking is that if you have some of your fruit preserved from the summer, you can whip it out now and enjoy it atop a creamy and crunchy base. The homemade preserves will add a personal and seasonal touch. I didn’t get to make much jam this year, except for a few jars of peach jam, so I used a four berry preserve (Dalfour). I wanted a more berry flavour, but you can use whatever jam you like. If you are looking for inspiration, here are a few that my friends have made over the past few weeks: Bam’s Kitchen has this perfect quick and easy Bammer’s Jammers made with cranberries and strawberries which would be a perfect sweet tart addition to the sweet white chocolate mousse, The Bartolini Kitchens just posted a very seasonal Quince Jam, which many would use on savoury dishes, I think it would work nicely here too, and Sugar et al has a gorgeous Rhubarb, Orange, Ginger Jam you can try, especially if you’re in the Southern Hemisphere and your spring/summer fruits are coming in. The meringues take a couple of hours at most to bake and the mousse takes only a few minutes, but it does have to chill. They can be assembled ahead and they will still be crispy when served. I wanted the meringues to be a pink hue with the white cream but since I’ve stopped using food colouring, and I was all out of my natural colours, they’ve stayed a white with a cream hue. You can add a touch of colour for some festivity. I’m sure they’d look very pretty in pink and white. 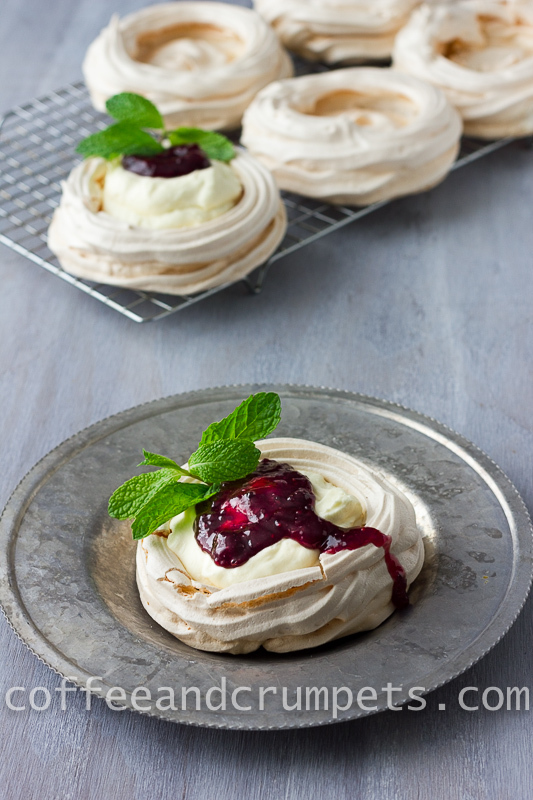 crisp and crunchy meringues filled with a creamy white chocolate mousse and topped with berry fruit preserves. Line a baking tray with parchment paper and draw a 6 4"(10cm) circles on the underside. Dollop the egg whites onto the parchment paper using the drawn circles as a guide or can pipe the egg whites to make a basket/nest to hold the mousse. Take ⅔ cups/160mL of the heavy cream and melt it with the white chocolate in bowl over simmering water or in the microwave, at 30 second intervals. If using the microwave, after each 30 second interval, take out the bowl and stir to mix and melt the mixture together. It took 90 seconds for me, but your microwave might take more or less time, as microwaves are all different. One the mixture is melted and homogenous, let it sit on the counter for about 20-30 minutes until slightly thickened and cool. Meanwhile, whip the remaining 1⅓ cups/315mL of heavy cream to stiff peaks. Once the white chocolate mixture is cool, fold it into the whipped cream. Blend carefully but thoroughly and then chill for at least 2 hours before spooning into meringues. To serve, spoon about ¾ cup mousse into the middle of the cooled meringue shells and add a dollop of fruit preserve on top and garnish with a sprig of mint. My meringues shells were a good size and if you prefer smaller ones, just pipe or dollop onto smaller circles. My husband was able to finish one off with no problem but my children and even I struggled to finish one. They were bigger than I anticipated. I thought that my white chocolate mousse was a bit sweet but the others didn't seem to have a problem. I would go easy on the fruit topping if you don't like yours too sweet. I haven't adjusted the recipe because my husband and children didn't find it sweet and so, maybe it's just me. I’ve been enjoying everyone’s Christmas cookie and biscuit posts thoroughly, who knew there were so many different types of cookies?! I don’t know how I am going to be able to try and bake them all. It will take me at least a year! Happy baking everyone! I hope everyone is keeping warm (at least in the Northern Hemi), we’ve had such frigid temperatures these last few days that I don’t even want to crawl out of bed let alone drive and run errands in below zero temperatures. I’m surviving on tea, coffee and my warm, fuzzy socks. Have a great weekend everyone! Good for you for not taking the even “easier” way out and using pre-made meringue nests. Damn those things are icky… bright white with a texture and flavour of sweetened drywall! These look lovely Nazneen – I finally made some successful meringues the other day… I’d never really tried them before but now I’ve got it down I think! This white chocolate mousse is looking so beautiful, apt for the snowy season ! Thanks for sharing awesome posts! simply loved the mint garnish. Thank you so much for your lovely comment Sonia! I hope to see you around. I know what you mean. Pumpkin can quickly become tiring. This dessert is makes a beautiful winter holiday dessert with the white green and red colors, never mind the taste — it’s wonderful. That’s a given. Thanks Mireya! These trimmed out quite festive and I am happy with them! Thanks for stopping by. btw, what is your suggested brand of white chcocolate for this recipe??? Thanks Dedy! That’s how I like it! I used an organic store white chocolate from a natural food store here because that’s what I had that day. I would’ve used a nice Lindt bar too. Dear Nazneen, so elegant…these would look so pretty as a New Year´s Eve dessert – I love individual desserts so much, they look so nice and they make serving dessert easier. The white chocolate mouuse sounds perfect with the meringue base and I would love to make them with some lovely black currant preserves – beautiful color and a bit tart, the a delicious match for the sweet and lovely meringue! What a very pretty presentation of a very classy dessert! My dear, I have to say that you have outdone yourself, again!!! This is one of the prettiest desserts that I have ever seen. I am proudly sharing it!!! ” … whatever you want to call them, all I know is that they are pretty darned good.” That’s good enough for me! Of course, it doesn’t hurt that these look so darned good, too. Really, Nazneen, these would look beautiful, not to mention impressive, on a holiday platter. You’re very welcome John! And thank you for the very sweet comment. They turned out really well and were quite tasty too! Thank you guys for the lovely comment! Can this recipe get any more prettier? I’m not sure, it’s gorgeous right now! I love how festive they look too! What a gorgeous dessert and one that is worthy of celebrating with! Meringues and mousse are sure ways to pamper anyone and they look so impressive! Thanks Abbé, they do look impressive don’t they? Love meringues! Meringues are my guilty pleasure and the addition of a chocolate mouse is extraordinary. Looks fabulous! I’m kinda pumpkined out too. Anyway, that’s sooo October and November! 😀 We’re ready for great stuff like these terrific look meringues. Really such a pretty dish, and I’ll bet the flavor is to die for! Very nice – thanks. Thanks John, that was funny and you are right, pumpkin is very October and November! And that’s why I’m done with it! I’m kinda bored of seeing so much orange everywhere, so this is a breadth of fresh air. I love making meringues, but haven’t in awhile. This looks so yumm withe the chocolate. They look perfect crisp and lovely. Thanks Candy, they were rather good! They’re not too difficult Bam, especially not for a seasoned cook like yourself. I think your Bammers Jammers would go perfectly atop this dessert! You’re welcome Sonali and thanks for the lovely words! I was dipping a bit and had to stop my self from polishing off the mousse! These are so elegant – definitely would impress at a dinner party! I can think of many great fillings but your combination looks and sounds delicious. The little sprig of mint is the perfect touch too. Thanks Monica! I live white chocolate and it sounded like a good combo, they turned out really well. I’ve always been too intimidated to make meringues. You did an awesome job, these look great. I’m not particular good at making meringues, but these look so pretty am going to have a go! Thank you Andrea! They’re not so hard once you get the knack of getting the whipping, you should have no problem! Lovely, lovely meringues! I’ve been thinking about making them to use up the lake of spare egg whites from a Sri Lankan Christmas cake recipe. And thanks for the jam links, will definitely look into the rhubarb ginger jam. Thank you so much for the lovely comment! Your cake sounds fascinating too! Hahaha, thanks Charlie 🙂 You know though, I’d take my cold weather over heat anyway, even the below 0 temps. Having grown up in the wet and cold of London, it’s in my blood I think! How perfect they look!! Just perfect!!! Thank you David! And yes, they are quite versatile and easily adjusted. I had never seen an Aga when I was in England because we had a regular stove and oven. I started to hear more and more about them recently but still and no idea. My hubby started working at a high end appliance store here and tenth have Agas! I made him take me to the store so I could check it out…..I want one! This is absolutely beautiful. I’m inspired. I’d love it if you linked this to Saturday Dishes. We are featuring Christmas dishes and this says “Christmas” to me. I’m tired of pumpkin too! These look so pretty! I love the topping! Thanks Lisa, yeah, you guys are getting all your summer goodies in. I love your garden and all the wonderful things you’re getting from it. The mousse meringues look pretty darn good, Nazneen. I’ve never made pavlova or meringues for dessert so will have to give them a try sometimes. I have few jars of freshly made pineapple jam. What do you think of the sweet tart pineapple jam on these? Will the taste complement with the meringues? Thank you Lail. Pineapple jam would be perfect beaches the mousse is sweet. A bit of tartness would perfectly complement.